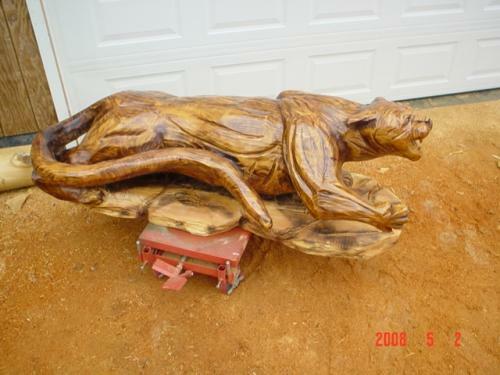 Eric carved this life-sized cougar in 2008. How he uses his chainsaw in such intricate designs is just awe-inspiring. This cougar is smooth, super smooth. After Eric created the sculpture, another ten hours was added just in the sanding to reach that high glossy smooth finish. The base has a mahogany stain and the cougar is finished with varnish. The cougar now resides with a very pleased client in Sacramento, California.